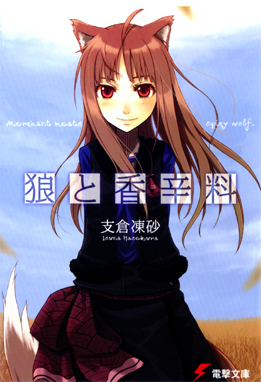 I finally finished watching Spice and Wolf last week, so here’s the review for it. I can now say that I’m looking forward to the upcoming sequel of it. Hurray! I seem to have this big issue with swapping tenses in my reviews. I’m never sure whether I should be writing them in past or present tense, so I inadvertently end up jumping around a lot, which is really annoying. (I’m sure most people don’t notice anyway, but I do when I go back to read them sometimes…) History papers are in past tense because we’re talking about the past. English papers are in the present because the book is fictional and we’re discussing it in the actual present. As far as I know, you should still use present tense even if its historic fiction. I suppose according to that reasoning, reviews should also be in present tense because we’re discussing it in the present and they’re fictional works… I just need to remember this next time I write. It’s way too much trouble to go back and fix everything I’ve written now… Bugger. So I’ve been writing reviews for a long time, sometimes for websites, sometimes for no reason other than to satisfy my own obsessive compulsive ways. I had a brief stint years ago writing reviews for Kiji-Anime.com before they folded, but other than that, most of my stuff has been self-published in my personal journals and websites like TOKYOPOP.com and MAL. I was wondering if there’s really a difference in standards between casual reviews and “professional” reviews in magazines and news sites aside from the obvious stuff like tone and grammar. Maybe professionals should be more objective, but I think it’s kind of funny that there’s such a strong general belief that reviews should be as objective and unbiased as possible when a review is essentially the exact opposite — it’s an opinion, what the reviewer thinks of the reviewed work intended to give the reader an idea of what someone else thinks. What people probably deem as objectivity is just a reviewer’s ability to explain and justify his assertions. Or, it could just be that the way some people write make it exceedingly obvious when they’re emotionally invested in a work and those are easier to pick from the crowd. This is especially true for anime and manga reviews because fandom is so prevalent in our subculture. It’s really hard to write with an objective tone for a series you really, really like, especially if you’ve just seen it and are cruising along on that fandom high. But I wonder, is that really so bad? Clearly if you like the series that much, you’re going to write a positive review regardless, but should your apparent enthusiasm take away from your analysis if you’re still able to provide reasons for why you liked it so much?